Upon the last resident's death in 1930, the heirs turned the house and property over to the bank to sell. Standard Oil attempted to purchase the lot where the house sits to build a gas station. Upon hearing the news, The National Society of the Colonial Dames of America in the State of North Carolina (NSCDA-NC), began a movement to preserve the colonial landmark as a museum by collecting money to purchase the property. Finally, in 1937, the NSCDA-NC purchased the Burgwin-Wright House for $21,000, and restoration efforts began on the exterior in early 1939. 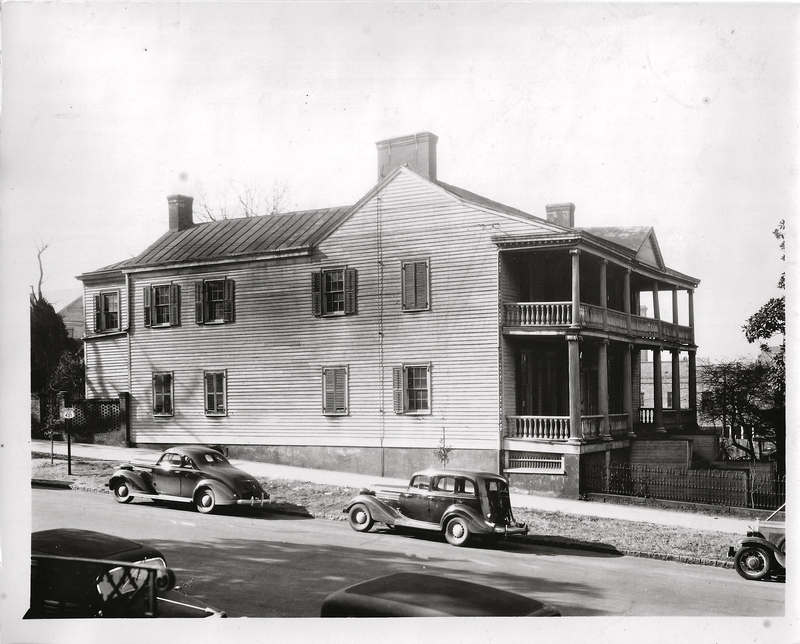 At the last NC Society Board meeting of 1941, the board was happy to announce the exterior work was done and members were looking forward to restoring the interior the following year. Four days later the Japanese bombed Pearl Harbor. All energy and funds were redirected towards the war effort. In 1943, the City of Wilmington leased the house as a Recreational Center for Commissioned Officers. The contract read that the city would lease the house and property for $1.00 but would invest $5,000 in repairs. “The Lord Cornwallis Lounge” opened in February of 1944 and continued to serve as an officers’ club until 1945. In 1946, after a seven-year hiatus, Erling H. Pedersen resumed his position as the architect in charge of the restoration of the Burgwin-Wright House. Restoration work actively began on the interior of the house in 1949. It is at this time that the house is outfitted with indoor plumbing and electricity and restored with original paint colors. Finally, in 1949 Henry Jay MacMillan furnished the museum with pieces he acquired from England. Today, those pieces are still on display, along with those donated by the Burgwin and Wright family and members of the NSCDA-NC. On March 30, 1951, the Burgwin-Wright House opened to the public as a museum while work on the grounds and in the house continued. In 1952, a relationship is forged with the public school system, and since every 4th grader in the county tours the house, free of charge. Local architect, Leslie N. Boney was hired to remodel what was the Cornwallis Lounge dining room in the basement that houses the visitor center today. 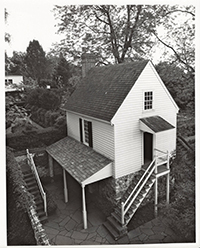 In 1954, Milton L. Crigg was hired to restore the kitchen house and is responsible for the colonial revival addition above the ballast kitchen. That year, the carriage house was lost to Hurricane Hazel. 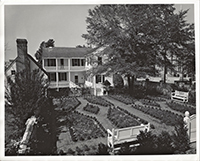 In 1962, Alden Hopkins, garden architect from colonial Williamsburg, was hired to complete the major project of creating an 18th century style gardens on the grounds- among the projects were the dipping pool, parterre garden, kitchen and herb gardens you see today. 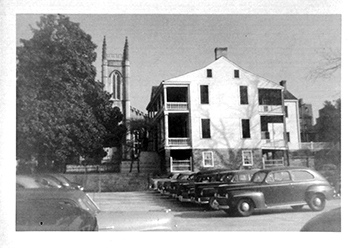 In 1967, the NC Dames acquired the used car parking lot on the west side of the house thus reuniting the 1744 city jail compound. Hopkins was again hired to create an Orchard but passed away before the work is completed. In his place another colleague from Williamsburg, Donald Parker, oversaw the project. Today, the used lot is the Orchard you can visit on the self-guided garden tour. In 1980,the NSCDA –NC received an award of merit from the Historic Preservation Society of North Carolina in recognition of their work in the field of preservation in regards to not only the structures they've restored, but the countless vulnerable ones they've brought awareness to. In 1984, a nationwide directive from the National Society of Colonial Dames of American's headquarters, Dumbarton House in Washington D.C., instructed all the states to focus more on education and historical accuracy than decorative arts. In response, the NSCDA-NC invited Dr. William Seale, a noted historian and former curator of cultural history a the Smithsonian Institute, to evaluate the museum. He recommended the house embark on a major historical research project along with proposed physical changes to the house to improve historical accuracy of the tour. In 1990, Colonial Era expert, John Bivins, was hired to assess the condemned front steps. The evaluation revealed that the front porch cypress Ionic columns were not original. Pedersen had made note of this in 1938 report, but believed them to be part of the 1845 renovations done by Thomas Henry Wright, and thus should remain. Bivins disagreed, dating them between 1900 and 1915. 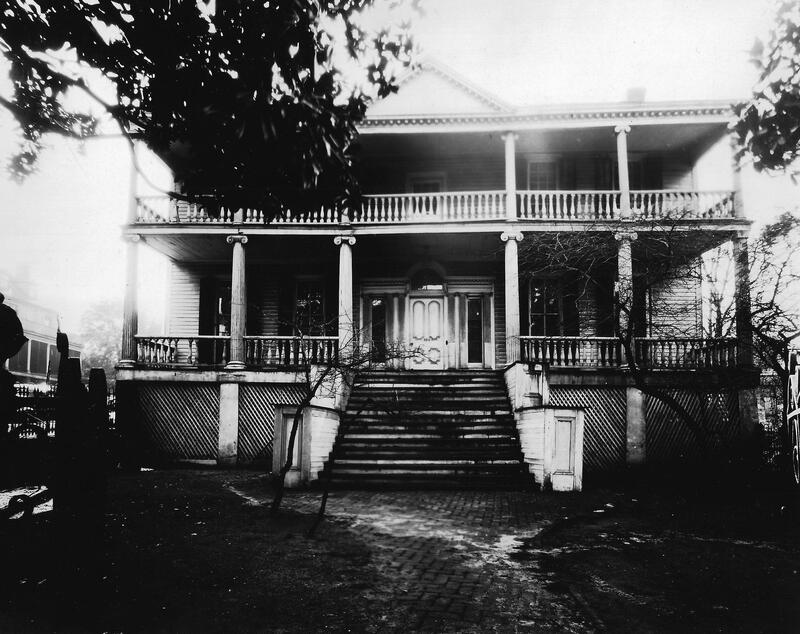 In 1992, following Bivins advice and under his supervision, colonial style columns were installed and a new staircase is constructed to increase the house’s colonial authenticity. In addition, the Burgwin-Wright House received a Historic Wilmington Foundation Plaque and a North Carolina Historical Highway Marker was placed on the third street side of the house recognizing John Burgwin. As part of the continuing efforts to interpret the house as accurately as possible, noted food historian Nancy Carter Crump was hired to evaluate and advise on the use of the kitchen for interpretation. In 2013, the gravel in the orchard is replaced with brick and the front porches are repaired. 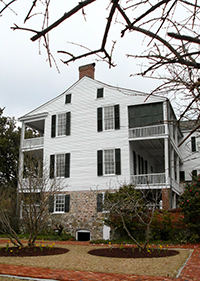 The ground floor of the house is opened to visitors for admissions and in-depth research on the house, Colonial North Carolina, Wilmington, and the families is conducted. The following year, the front steps are repaired, the house and outdoor kitchen are repainted, and the electrical is updated. Exhibits by University of North Carolina at Wilmington (UNCW) history interns are installed in the exhibit hall on the 1744 city jail, the infamous Wilmington tunnels, and the history of the restoration of the house. In addition, a well-researched and peered reviewed tour of the house and property is launched. In 2016, the Grand Hall in the house is restored , the original long-leaf pine floor are refurnished, and an archive that houses a variety of original documents and artifacts is established in the upstairs addition of the kitchen House. lastly, two additional exhibits are installed on the long-leaf pine which the house is made of, and the families that once lived in the house. In 2017, the ground floor that was once the jail is renovated as a visitor center that houses a gift shop, restrooms, exhibit gallery, and space to host talks, art shows, and school groups. The East chimney is repaired, the kitchen house roof awning is rebuilt, and the house is climate controlled with new efficient systems important in regards to collection care.